Many of our native plants have evolved to handle Texas’ “if-you-don’t-like-the-weather, just-wait-a-minute” fluctuations. However this year’s drastic changes in temperature and moisture have been particularly hard on onions. 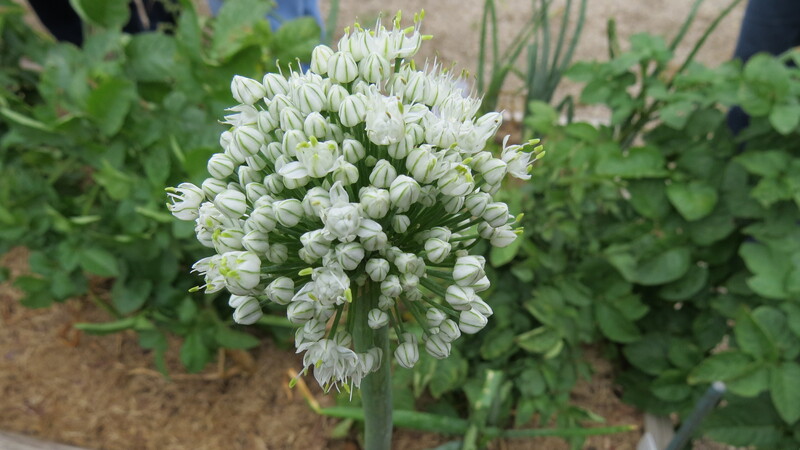 Jim Dempsey reported that after the last hard freeze, at least one fourth of the Demonstration Garden’s onions were lost. Now many onions are beginning to bolt (i.e. go to seed). Other vegetable gardeners throughout Dallas are reporting that more than the usual numbers of their onions are bolting. Why is this happening? An Onion in Full Bolt! According to Dixondale Onion Farm (www.dixondalefarm.com) in Carrizo Springs, Texas, there are several causes for onions bolting. Bolting in onions is a survival mechanism in response to stress. The onion “thinks” it is dying and sends up a flower stalk in order to reproduce to insure its survival into the next generation. Temperature fluctuations and cold weather stress are the most common cause of this. Dixondale’s website says that “when the temperature is below 45 degrees Fahrenheit for a prolonged period, the plant becomes dormant. When the temperature rises, the plant grows. If cold weather returns, the plant goes dormant again, and with returning warmth, it will grow again. Two or more dormant/growth cycles will likely result in bolting.” This certainly sounds like our winter/spring!! Other factors that contribute to bolting in onions are: (1) Too loose a soil: if onion roots are too disturbed, the onion may react by thinking that it is starving and begin to prematurely go to seed; and (2) Over-fertilization which results in the onion’s growing too quickly. Though both of these causes may be prevented by correct onion planting practices, there isn’t much that can be done about the weather. Posted in Vegetable Gardening in Dallas and tagged 1015 Y Onions, onions, Spring Vegetable Harvest in Dallas, vegetable gardening, Vegetable Gardening In Dallas. Bookmark the permalink. Have you decided on next year’s onion planting date yet?